Yellow-Eyed Penguins are classified as a rare species of penguin, found only in New Zealand. 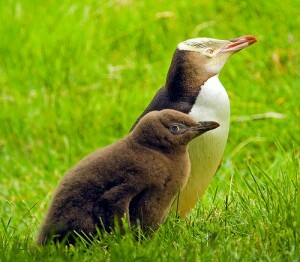 Prior assumptions suggested its resemblance to Little Penguins but with more recent studies suggest its links with those of Eudyptes genus. It is also known by name of Hoiho in Maori. Very few of them are left now which is why they have been called endangered. Due to their yellow colored eyes and the stark yellow band around their eyes, they are named as such. What do Yellow-Eyed Penguins Eat? A brief description about its appearance is given here. Size : It is quiet a large penguin, having a length of between 27 and 30 inches. Weight : Maximum it may weigh around 7 to 8 kg prior to molting and right after it, weight might go down to a minimum of 5 to 6 kg. Color : Juvenile yellow-eyed penguins have a grayish head and gray iris, unlike the adults that have light yellow heads with yellow iris. Adults have black feathers, with dark brown throat and chin. It has bright stripe of yellow from the nape to the eyes. 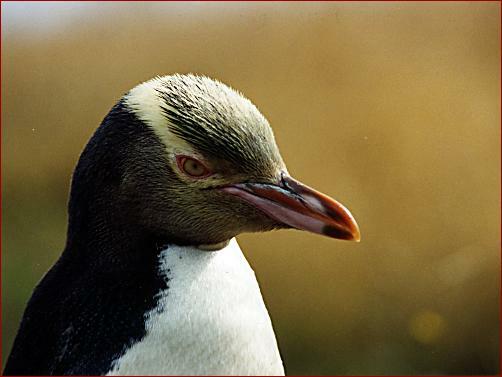 Hundreds of years back, their range constituted only of sub-Antarctic islands but after Waitaha Penguin suffered extinction, it extended its territories to New Zealand. In New Zealand, the penguins are distributed in Stewart Island, Auckland, South Island, Campbell Islands and Foveaux Strait. New Zealand’s South Island, Aucland, Stewart and Campbell Islands are some of the places where it breeds. Their breeding habitats include scrubby areas and forests, amidst lupin and other trees. They make nests in furrows, slopes as well as the beaches itself. These habitats are a part of large or smaller bays. Though penguins generally form colonies, these yellow-eyed ones are known to be making nests beyond the sight of others as they are not very social. The male and female both actively engage in incubating the eggs. While one parent goes for feeding at the sea, during the day, the other safeguards it. They chase their victims diving as deep as 60 meters. They have an annual moulting pattern, taking place in February for a month or so. In the moulting period, they lose considerable weight as it restricts them from venturing out to the sea for eating. It produces a range of sounds for various occasions. 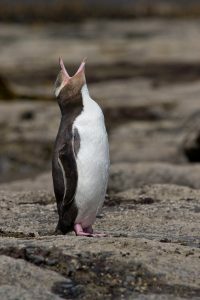 Very shrill long calls are produced by men during mating rituals and calls for locating each other during comebacks from foraging trips are common. Short calls are also used for communicating when they are on land. Fish is their primary food, comprising about 90% of their diet. Different fish species that it eats include opalfish, blue cod, New Zealand Blueback Sprat and red cods. Apart from fishes, they feed on arrow squids as well. When they are young, they mostly feed on a diet of squids, unlike the adults. Young penguins are at a major risk from their enemies that are mostly stoats, feral cats, rats and dogs. At sea, shark species are its common threats. Other than these, humans degrading their habitats, destroying them are also other threats. Unknown diseases are another cause of worry for these penguins as it already happened in Stewart Island, killing almost half of the juveniles. They have smooth feathers that insulate their bodies, which help them swim in water although they cannot fly on land. In order to swim swiftly, feet are closely tucked together in with the body for a streamlined effect. They have sturdy muscles in the breast which instills strength in the flippers. Flippers are composed of flat bones held tightly, which aids in swimming. Tails help them in hiking as well as walking on land. Position of the legs not only help them swim but also allow them to walk straight. Beaks help in obtaining food, during fights and also for preening. To grasp the fish in its mouth, it is equipped with arrow like features which hold the prey tight till it is gulped down. They use their feet and flippers to get rid of the heat, which is why they turn pinkish during heat. Fat layer buried under the skin helps in retaining the heat in the body during cold. They are armed with extra layers of feathers to keep them warm by locking them up. It uses the oil secreted by the gland located at the tails end for cleaning or oiling its feathers. It body color also saves t from predation in water. They engage in courtship in the month of august. Breeding occurs in the month of September, when the females lay around 2 greenish eggs in the nests which have already been made in August. Color of the eggs changes from green to white in the next 24 hours of being laid. Sexual maturity is attained by the age of 3 or 4 when they breed start breeding. Both the parents incubate the eggs for around 40 to 50 days till they hatch. The chicks are born after 40 to 50 days of incubation and are being taken care of by the parents till they are big enough to fend themselves. In the next 6 weeks after it hatches, they take turns while guarding the chicks. Whoever goes for feeding comes back to feed the baby and undertakes the duty of being with the chicks. To cater the demands of the hungry chicks, after 6 weeks, both go for hunting food for them. In February, fledging occurs and they are set free. As per their natural history, they have a long life span, often living for around 20 years or even more. Compared to the females, males live much longer. No sub-species of the Yellow-eyed penguin have been found yet. They are a protected species and hence petting them is illegal in New Zealand, where they are found. They have been listed under the Endangered section by IUCN Red List. 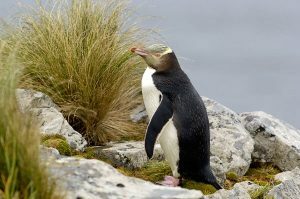 Various conservational programs have been initiated to protect the species by the Yellow-eyed Penguin Trust apart from recovery plans. It has also stressed to keep dogs out of their breeding sites to ensure complete protection. It ranks 4th among the different species of penguins, with a height of more than 60 cm. They have a tendency to come back to the site to breed where they have taken birth. Moulting can be highly fatal as it stresses the bird to the maximum, which can even kill it. New Zealand currency of $5 has its image printed on the back side of it. It is the official face of a recycling and waste management campaign of Dunedin City Council. Meaning of its scientific name is “big diver from the southern lands” and that of Hoiho is “noise shouter”. They feed their chicks by regurgitating the food stored in their stomach. Only 1500 to 1700 pairs of yellow-eyed penguin population were identified in a survey in 2010. 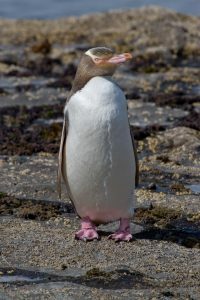 Some of the images of the Yellow-Eyed Penguin listed here will give you an idea of their appearance.